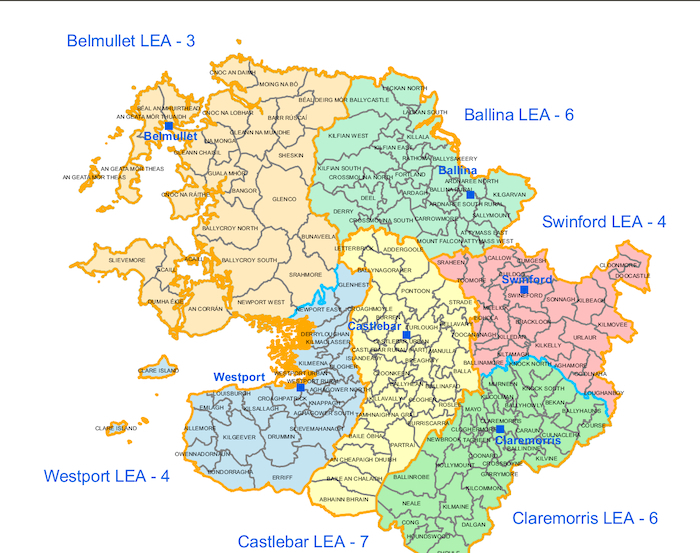 The local election areas in Mayo for this May's local elections. Fine Gael held two selection conventions over the weekend to further firm up their ticket going into May's local elections. At their Ballina Muncipal District convention on outing councillors Jarlath Munnelly and John O'Hara were joined on the ticket by Kieran Gill and Aileen Horkan. In the Castlebar Municipal District sitting councillor Cyril Burke has been selected alongside former county councillor Eugene McCormack and former town councillor Ger Deere to contest the election. "I want to be a strong and effective voice for all with these concerns. I want to go to the European Parliament and help find the best answers and implement the solutions to those difficult questions. "As a girl who grew up in the West of Ireland, I see the abundance of opportunities that we in the Midlands/North-West have to offer. From our beautiful rural villages like Shrule and Leitirmore to communities like Westport and Letterkenny, we are incredibly lucky to have diverse and talented resources. This is a pivotal time for all concerned here and I want to effect change,” Ms Walsh said. "I want to become an MEP and represent the interests of a wide constituency that is going through many changes." Ballina (population 25,110 ): Ardagh, Ardnaree North, Ardnaree South Rural, Ardnaree South Urban, Attymass East, Attymass West, Ballina Rural, Ballina Urban, Ballycastle, Ballysakeery, Carrowmore, Crossmolina North, Crossmolina South, Deel, Derry, Fortland, Kilfian East, Kilfian South, Kilfian West, Kilgarvan, Killala, Lackan North, Lackan South, Mount Falcon, Rathoma, and Sallymount. Castlebar (population 29,992 ): Abhainn Bhrain, Addergoole, An Cheapaigh Dhuibh, Baile an Chalaidh, Baile Óbha, Balla, Ballinafad, Ballyhean, Ballynagoraher, Bellavary, Breaghwy, Burren, Burriscarra, Castlebar Rural (part ), Castlebar Urban, Clogher, Cloonkeen, Croaghmoyle, Killavally, Islandeady, Letterbrick, Manulla, Partraí, Pontoon, Roslee, Strade, Tamhnaigh na Graí,and Turlough. Claremorris (population 27,141 ): Ballindine, Ballinrobe, Ballyhaunis, Ballyhowly, Bekan, Caraun, Claremorris, Cloghermore, Cong, Coonard, Course, Crossboyne,Culnacleha, Dalgan, Garrymore, Hollymount, Houndswood,Kilcolman, Kilcommon, Kilmaine, , Kilvine, Knock North, Knock South, Mayo, Murneen, Neale, Newbrook, Shrule, and Tagheen. Westport (population 18,378 ): Aghagower North, Aghagower South , Aillemore, Bundorragha , Clare Island, Clogher, Croaghpatrick, Derryloughan, Drummin, Emlagh, Erriff, Glenhest, Kilgeever, Kilmaclasser, Kilmeena, Kilsallagh, Knappagh, Newport East, Louisburgh, Owennadornaun Slievemahanagh, Westport Rural and Westport Urban. Swinford (population 17,286 ): Aghamore, Ballinamore, Brackloon, Bohola, Callow , Cloonmore, Coolnaha, Cuildoo, Doocastle, Kilbeagh, Kilkelly,Killedan, Kilmovee , Kiltamagh, Loughanboy, Meelick, Sonnagh, Sraheen, Swinford, Toocananagh,Toomore Tumgesh, Urlaur.